Here is a perfect example of why you absolutely must do some basic due diligence before inserting your brand into an existing news cycle. By now, we’ve all heard about the horrible tragedy in Aurora, Colorado – where a lone gunman claimed 12 lives and injured 59 more people, including a 4 month old baby. Well, apparently, everyone heard about it except the PR representatives for an online store called CelebBoutique. 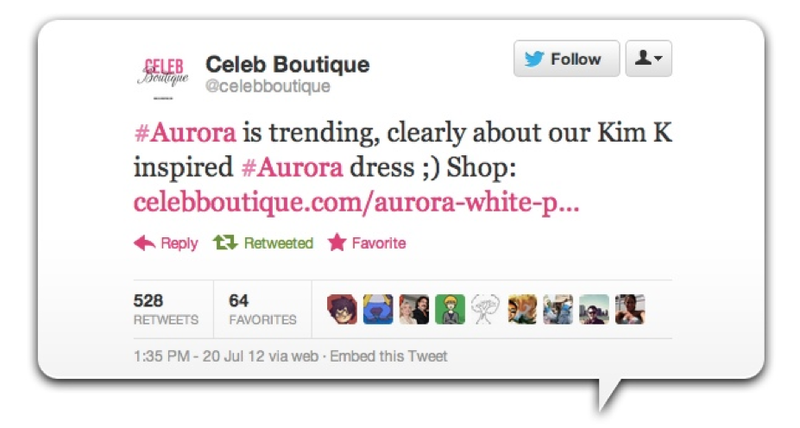 Earlier today the clothing store’s PR rep saw that “Aurora” was trending on Twitter. Instead of conducting a simple Twitter or Google search to find out why that word was trending before inserting their brand into whatever the story might be, the PR rep blundered blindly right into a well-deserved firestorm. Because of the way the Tweet was written with phrases like “clearly about” and the “wink-smile,” many people (528 at the time of the screen grab) assumed Celeb Boutique knew what the topic was about. They angrily reTweeted and bashed the brand for a total lack of humanity and an attempt to turn the massacre of innocent people, including children, into a marketing ploy for a dress. Now, I think we can all assume that wasn’t the case and there is no way this was deliberate. Stupid, yes. Incredibly, mind-bogglingly stupid. But, certainly not deliberate. Now, we all make mistakes, I know I do. But, this is such a powerful reminder that a small amount of research can go along way. Before you issue that Top Ten List that ties your brand to some super cool tips, do a quick Google search to see if your competition got there first. Before you pitch a reporter on the terrific angle that will connect your brand to a super hot topic, take a look to see if the reporter has already covered that story. Before you spend thousands of dollars commissioning a study that shows consumers want what you’ve got, take a look around the interwebs to see if that study already exists. And, before you hijack a trending topic on Twitter – in the name of all things good and right with the world – take two seconds to see why the topic is trending in the first place.